Traditional truck telematics systems offer fleet managers a lot of data on the performance of their drivers and vehicles, but integrating onboard cameras can provide valuable information that those systems can’t capture on their own, according to technology suppliers. Carriers increasingly are adding video-based safety and monitoring systems to their trucks to help identify which drivers could use extra coaching while collecting data to inform future business operating decisions through predictive analytics. Onboard video is one of the only methods to effectively and accurately document potentially dangerous on-road driver behavior such as inadequate following distance, using a cellphone while driving or not wearing a seat belt. Video technology suppliers factor such behavioral information into their driver safety analyses. The cameras typically don’t record constantly; events such as a hard brake or a sudden swerve trigger the camera to save and archive video from seconds before and seconds after the incident. Technology suppliers’ systems analyze the collected data to track patterns and pinpoint anomalies to determine which recorded incidents are significant safety issues that might require further action. Establishing patterns through analytics ensures that drivers who chronically exhibit potentially dangerous behavior receive attention, not those who might have had a one-time incident in a long history of safe driving. “The individual that you’re trying to look at and prioritize within the fleet is the one who’s doing it all the time … a habitual problem,” said Jim Angel, vice president of video intelligence solutions for PeopleNet, a supplier of fleet­management technology. Other suppliers of onboard video systems include SmartDrive Systems, Netradyne, Omnitracs and MiX Telematics. Onboard video systems can rank all of a carrier’s drivers based on their assessed safety ratings. Often, the tech supplier assigns a color code — typically green for the safest drivers and red for the least safe — and attaches video clips to a driver’s performance data if they have any recorded incidents. “Drivers are graded against their own fleet” so the metrics are consistent across an entire company, said Pete Allen, chief client officer at MiX Telematics. Some companies also provide anonymized, industrywide results so carriers can understand how their drivers perform compared with the industry at large, which makes the analytics “that much more statistically significant,” Lytx’s Riordan said. Fleet managers com­monly use the analytics reports to easily determine which drivers could benefit from additional training, or which terminals and regions need improvement. “If you’re the [vice president] of safety and responsible for 100 different terminals nationwide, you can … see the top 10% of terminals compared to the overall company score,” Angel said. Risk assessment is a common way fleets use onboard video system predictive analytics. The “predictive” portion doesn’t mean the system forecasts with absolute certainty which drivers will end up in an accident, but rather that it predicts which drivers or business sectors pose the greatest future safety or financial risk to the company. Video analytics identify risk indicators that are causal, such as a driver causing a collision, and correlative, such as a driver not wearing a seat belt, to assign each driver a risk coefficient. For Melton Truck Lines, the camera system has “definitely created opportunities for people to be better in ways that we might not have been able to previously [identify]… until an accident happened. Now I get to look at skills every day and coach and provide training every day without an accident happening,” Buchanan said. Melton ranks No. 92 on the Transport Topics Top 100 list of the largest for-hire carriers in North America. Meanwhile, video analytics is becoming faster and more efficient through the expansion of “edge computing,” in which more data is analyzed at the point where it is collected — in this case, on board the truck — rather than in a central location. Thus far, risk assessment tends to be the most common function for video analytics in trucking, but systems also can expose anomalies that affect carriers’ finances and could play a role in improving business operations. Certainly, preventing accidents saves legal and truck-repair costs. But video-assisted analytics also can detect discrepancies in areas such as hours-of-service information or truck function and maintenance needs. “The system can provide overall cost savings to the fleet by identifying inefficiencies in areas like fuel consumption and driver behavior. These savings are important to fleet managers,” MiX Telematics’ Allen said. 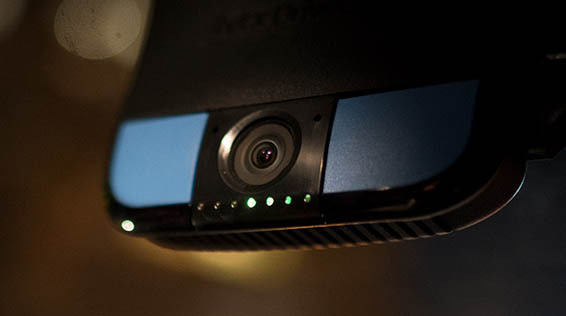 Dash cameras are standard with video systems, but some fleets choose to add exterior cameras — typically rear- and side-view cameras — to their trucks. Although analytics of exterior ­video is in a more nascent state than in-cab video analytics, expanding those capabilities is considered the next major area of opportunity. Individual companies are finding their own ways to use cameras around the vehicle. “In a year, it will be neat to watch the new ways these businesses use the technology,” Lytx’s Riordan said. While the driver-facing cameras provide more safety-centric data, the exterior cameras are more for operational uses, and a little safety, he said. Currently, uses of exterior cameras include gathering data about cargo security, service assurance and service delivery confirmation, as well as potentially hazardous weather conditions that contributed to a recorded incident. In waste and recycling applications, cameras can be mounted above the material hopper to record what gets loaded into a truck. The video evidence tracks which clients might include unacceptable materials in their loads, giving carriers an opportunity to address the situation. Video also can protect fuel carriers by showing that drivers are following strict procedures when delivering fuel to a gas station. Also, some fleets have tied their video telematics information into their safe driver recognition programs, Riordan said. Recognition tends to boost driver satisfaction, performance and retention rates, which can improve a carrier’s bottom line. Analytics also can detect changes in a driver’s behavior that deviate from his or her normal patterns and could signal that the driver is likely to quit.